LTC Italian Old Style was originally released by P22/Lanston Type Company in 2006 as a basic 4 font family. This design is not to be confused with the English Monotype font also called "Italian Old Style", an earlier design from 1911 based on William Morris's Golden Type, which was itself based on Nicholas Jenson's Roman face. Rather, LTC Italian Old Style is based on Frederic Goudy's interpretation of Nicholas Jenson's Roman face and other Renaissance Roman faces. The Goudy design is considered by most to be the best Renaissance face adapted for modern use. Italian Old Style has been updated by James Grieshaber for the Lanston Type Company and is now offered as a pro font family containing 4 styles- Regular Pro, Italic Pro, Light Pro and Light Italic Pro. 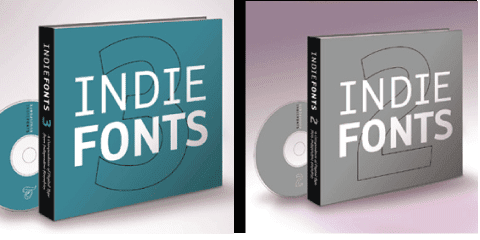 Features contained in the pro fonts include the original ligatures, small caps and expanded language coverage. The pro Roman styles, Regular and Light, also welcome the addition of ornaments. Noted American typographer, Bruce Rogers, was one of the biggest admirers of Italian Oldstyle and designed the original specimen book for Italian Oldstyle in 1924 using his trademark ornament arrangement. These ornaments are now contained in the pro versions of the Roman styles. 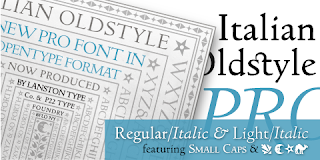 The LTC Italian Old Style Pro Family of 4 fonts is being offered at a very special introductory price of only $49.95 (reg. $99.95) for a limited time- a savings of 50%. This offer expires on August 31st. Package options are available online for the original basic styles and for those without applications that do not support Opentype features. 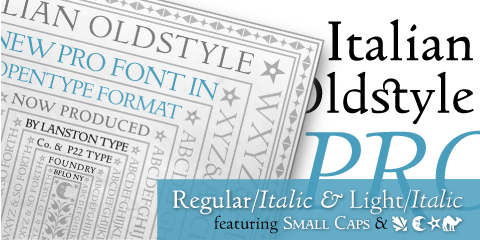 More information is available on the LTC Italian Old Style Pro Family page. Upgrade pricing is available for previous registered users of Italian Old Style (family only). For more details, please contact p22@p22.com.